Founded in the early 90s, Canna produces nutrients and growing mediums for the cultivation of fast growing plants. They oversee the complete production chain – from development to research, to marketing and sales, and the unique eco-friendly production line. Their passionate scientists work on the marvels of nature within their own logistics department and laboratory. Years of thorough research shows Canna’s passion for growing, and the quality is clear through the worldwide recognition they get. 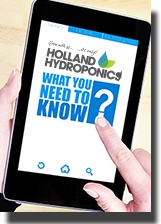 Products range from professional soil mixes to A+B nutrients for Hydro, Aqua, Terra and Coco, and additives such as Rhizotonic, PK 13/14 and CalMag. Each Canna product has been created with carefully balanced combinations, designed to offer you the best yields possible when growing, giving stronger and healthier plants. The original zym from Canna. Canna Bio Vega & Flores are 100% organic feeds specifically developed for the growth and bloom phase of your plants life cycle. Bio Vega stimulates the plants root zone, aiding its development that results in explosive plant growth as it prepares to enter the bloom phase. Bio Flores contains a hop extract which provides many of the minerals your plants require while flowering. Canna made sure these minerals are readily available in the correct proportions to help your plants produce an abundance of healthy fruits and flowers with amazing tastes and aromas. Canna CalMag Agent is a calcium and magnesium supplement that stabilises EC and improves nutrient uptake resulting in stronger and healthier plants.